And still nobody gives me their seat on the train. In all fairness, it could still be assumed to be a beer belly (and who wants to give up their seat for that!) and it's harder to tell when I'm not wearing a swimsuit. Nearing the halfway mark, we have done some work on the Baby Room. That dresser, adorably enough, was Dave's when he was born. The glide rocker rescued off the corner before the garbage trucks could take it away. It has cleaned up nicely, and the stains that remain would probably have been put on there by us soon enough anyway. And it is ridiculously comfortable. The futon is obviously on its way out, we just haven't quite figured out a good place to put it yet. The question is: to paint or not to paint? 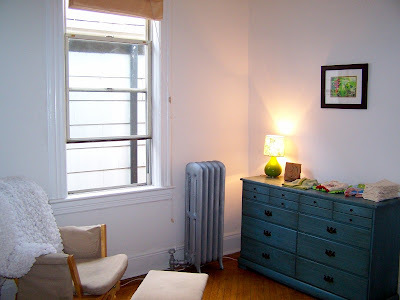 I have this overall desire to paint in a kind of vague-but-intense nesting urge sort of way, but I have no specific vision for what color the room should be, and, generally speaking, I'm don't-paint-unless-you-have-the-vision kind of gal. All of the rooms in our house are white. They came that way, and we have not yet had either the necessary vision or the energy to move all our stuff to do anything about that. (I'm not even sure we ever will--nothing is screaming to me that it needs to be painted, specific color or otherwise). 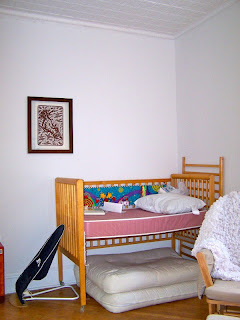 And the Baby Room is something of a dark-ish room--which is good for keeping the child asleep purposes, but I don't want to darken it more. Also, I don't know this baby yet. Maybe Roo wouldn't like a yellow room. Maybe that wouldn't work at all. And even if she's a girl, maybe the pink blush I was thinking about just won't be her kind of thing. I do recognize that we are talking about an infant that won't necessarily have preferences of this sort, and that we can paint over any paint-personality conflicts that may arise, but...I may find that it's wrong way before Roo can express any opinion on the matter. And nesting urges notwithstanding, the white looks cool and clean and peaceful to me. 1. The chances of you painting AFTER you meet the child and determine its personality are very, very slim. 2. Wall decals are perfect for people with white walls and fickle tastes. We are big fans of wall decals. 3. I hope you don't think it's too creepy that I post even though we've never met. I feel like we've met. And we got along swimmingly. So there. We've totally met, just not, you know, in the flesh. And we're huge fans of each other. I gotta look into some wall decals. i hate to tell you but people are very rude these days and the chances of them offering you a seat on the bus/metro may be very slim. Okay so first I'm excited you are showing. Is the baby moving yet? As for the walls I agree with Laura, decals are great and they come in all kinds of characters. Or you could just put a border around the middle of the wall. Good luck.